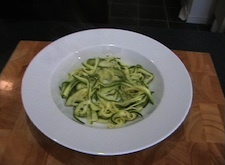 500g courgette, sliced with a mandolin then finely sliced like spaghetti. A small handful of chopped fresh parsley. Before you start have all the ingredients out and prepared. Put a large pan of boiling water on the hob, put your small saucepan on the hob (off the heat) and turn your grill on to high. Now click here! 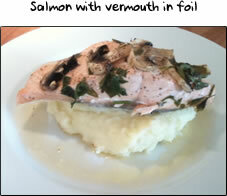 Before you start take the salmon out from under the grill and click here! Preheat your grill to high. 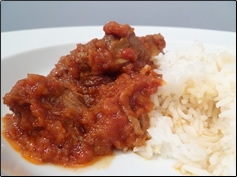 Have a pan of salted boiling water on the hob along with another pan to cook the tomatoes. Season the salmon on both sides with salt and pepper then put them under the grill for 2.5 minutes. 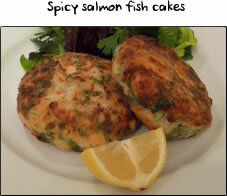 Once you've put the salmon under the grill, put the courgette spaghetti into the boiling water for 1 minute. Whilst the courgette is cooking, put the chopped tomatoes and chilli powder into the other pan on a medium heat. After a minute, drain the courgette and leave it in the colander until you need it. Turn the salmon and grill for another 2.5 minutes. 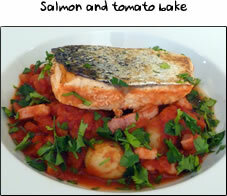 Once the salmon is cooked, remove to a board and gently flake chunks of it into the pan of chopped tomatoes. Add a pinch of salt and pepper. 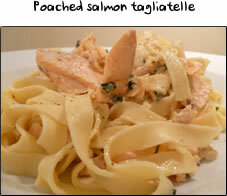 Fold the salmon and tomatoes together, taking care not to completely break up the fish. 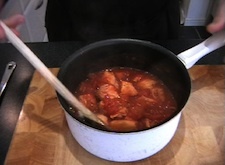 Add in the chopped parsleyand carefully stir. 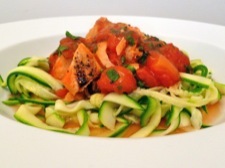 To serve, place some of the courgette spaghetti into your bowl or plate and spoon the salmon & tomatoes on top.